Just as its predecessor did in Chicago (2008), the completely sold-out Second Wave of Modernism II conference last week at New York’s Museum of Modern Art (MoMA) generated lots of buzz and a bit of controversy. Attendees from around the country, plus Canada, Germany, Israel, the Netherlands, Switzerland and the United Kingdom, filled every one of the auditorium’s 350 seats – and they stayed to the very end. TCLF organized the event, which was co-curated by Charles Birnbaum and Jane Amidon, co-sponsored by MoMA and the recipient of tremendous support from Charles Luck and Landscape Forms. 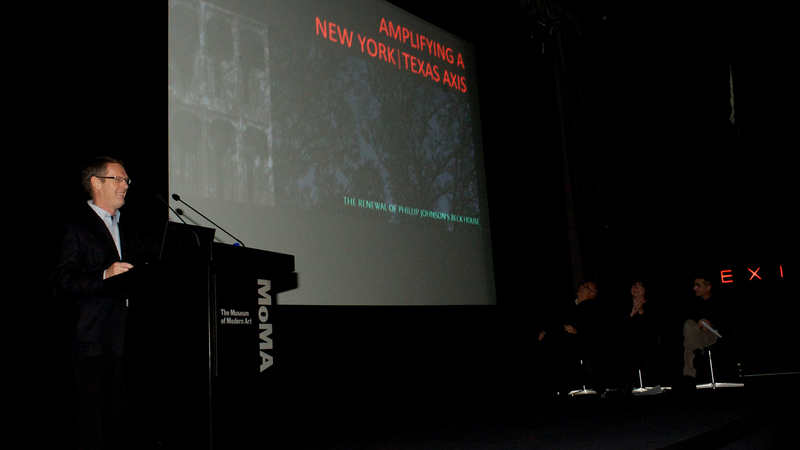 MoMA’s Chief Curator of Architecture and Design, Barry Bergdoll, provided opening remarks followed by co-curators Birnbaum and Amidon who provided a framework for the day’s speakers. During the opening session, Residential Transformations, moderator Joeb Moore laid the groundwork by focusing on the shift away from the building as an object to the building as an integral part of a larger social and environmental system and landscape. Los Angeles-based Lisa Gimmy led with her landscape design at Richard Neutra’s Kun 2, a late career work by the architect threatened by possible landslides. Gimmy deftly articulated her design process developed through the lens of Neutra’s acute sensitivity to site as the impetus for his architecture. She illustrated how Lockwood de Forest and Ralph Stevens’ work at Neutra’s Tremaine House set some precedents for her work at Kun 2. Christopher LaGuardia and Gary Hilderbrand continued the session with explorations of Norman Jaffe’s Perlbinder Residence in East Hampton, NY, and Philip Johnson’s 1964 Beck house in Dallas, TX, respectively. LaGuardia, a former colleague at Jaffe’s firm, provided fascinating insights into the architect’s work and the significance of revisiting the Modernist house with new intentions. He examined Jaffe’s design process and philosophy, interpreting the significance of his designs and the translation to the landscape. Hilderbrand addressed Johnson’s heroic architectural formalism and notable detachment from the landscape itself. He shared insights about how he aimed to recoup the surroundings with selective interventions. In particular, the complicated process of reengineering the site’s degraded creek bed and bank, and restoration of the tree groves and orchards, and by extending original programmatic intentions. He also illustrated his presentation with representative images of the simple Modernist palette he used to develop the language of insertions – connecting the house to a landscape that employed a new geometry of repetitive terracing that focused attention on the creek and floodplain to the east. Conference attendeesThaisa Way adroitly moderated the second panel, Urban Renewal Re-Evaluated, which began with Miami-based Raymond Jungles’ incisive examination of the development of Miami’s iconic Lincoln Road. He followed with an in-depth look at his 1111 Lincoln Road project and work done to discover the shared philosophies of first wave Modernists that continue to speak to his need to stitch together the built and natural environments. With Lincoln Road, he explained, the goal was to capture the geometry, scale and movement of the Brazilian plazas of Roberto Burle Marx, while addressing mixed use programmatic elements and historic preservation guidelines. Highlights of his talk included stories of Roberto Burle Marx who became his mentor and friend. Speaker Charles Renfro took an intimate look at the influence on glass and its role in transforming Modernist design. Using several examples of second wave Modernist design, he revisited the use of glass as a primary finishing material and analyzed how its use, is sometimes contrary to the original architect's stated intentions, and the significance of understanding the material through its own local and urbanistic effects. Renfro finished with Diller Scofidio + Renfro’s redesign of New York’s Lincoln Center. Beth Meyer and Michael Van Valkenburgh spoke to Dan Kiley’s design process for the Jefferson National Expansion Memorial and how that has influenced their work at the site. They provided insight into a major shift in focus to less intensive management practice that the site’s stewards and, in general, the public have adopted and how that has affected their goals. The day’s final session, Metropolitan Transformations, began with a cogent and sweeping opening by Landscape Architecture magazine Editor-in-Chief Brad McKee. Julie Bargmann spoke to the ramifications of the first wave of Modernism’s obsession with the form of the product, as compared to the desire of the second wave to embrace the form of the landscape of production. Her background as a sculptor is evident in her work at the Urban Outfitters headquarters at the Philadelphia Navy Yard and demonstrates her skillful use of reimaging an industrial site and repurposing its site materials. James Corner continued the discussion of thoughtfully integrating existing layers, in particular, with The High Line project, Qianhai City, and Seattle’s Waterfront. Kathryn Gustafson expanded the discussion of layers by detailing the importance of engaging the full set of resources in two examples: Nashville’s Centennial Park and Parque Central in Valencia, Spain. With these projects, she outlined her philosophy that creating vibrant spaces that engage both the environmental and human culture must also be maintainable, pointing out, people maintain what they love. The day concluded with the three moderators providing summary statements that were culled from audience questions submitted via twitter. ASLA’s Jared Green reported about the conference for The Dirt. Here’s his coverage for each of the three sessions: Residential Transformations, Urban Renewal Re-Evaluated, and Metropolitan Transformations. Duncan, and Mary Margaret Jones. Following the conference, the day was capped off with a sold-out evening reception hosted at James Corner Field Operations, with guests including conference speakers, Field Operations staff, TCLF Board Members, and representatives from Charles Luck Stone Center, the reception’s sponsor. Everyone took full advantage of the wonderful views from the 10th floor offices, just a short hop from The High Line. Guests savored several different wines (“blond bar” to prevent red wine stains) and appetizers (the little mozzarella one was a huge hit), while mingling amidst scale models (projects, not people) as videos of Field Ops projects were screened. The music was also superb. The following day, featured sold-out morning tours of the newly opened 9/11 Memorial and The High Line, along with a boat tour from lower Manhattan along the East River waterfront, all co-hosted by the New York ASLA Chapter. The 9/11 Memorial tour, led by project manager Matthew Donham of PWP Partners, started with a panoramic view of the site from the W Hotel’s luxe 5th floor lounge. Donham explained the complex design history before leading the group for a well articulated tour of the site – a moving design which includes a bosque of swamp oaks trees set between bands of rough granite pavers and lawn panels which marked the approach to the twin Memorial pools. When finally completed, the site anticipates receiving 5-7 million visitors annually. The High Line Tour. Photo by Meredith BzdakJustine Heilner and Elizabeth Fain Labombard, of James Corner Field Operations, led guests through Sections 1 and the newly completed Section 2 of The High Line, which has become an international sensation. The former rail line, elevated five stories above ground and re-developed as a destination linear park, has been interpreted with bold contemporary design features and sumptuous plantings, all of which integrate the site’s striking industrial features. Intimately involved in the project from the start, the tour guides provided tremendous insight into the challenges presented by this unique site. The boat tour’s more than 70 attendees departed from South Street Seaport for a four-hour design fest that showcased three recent award-winning parks along the East River waterfront: Erie Basin Park, Brooklyn Bridge Park, and Queens West Stage 2 and Gantry Park. Attendees were met at Erie Basin Park in Red Hook, Brooklyn, by designer Lee Weintraub who detailed his efforts to re-imagine the former industrial space into a park that embraced its past, including salvaging several of the site’s original gantries and retaining and expanding existing fishing facilities. Weintraub explained the influence of the original design on the park’s furniture and how the meandering pathways both mimic the shoreline and provide a guided visitor experience. With the gantries framing the surrounding skylines, the inviting site successfully draws visitors to the once disconnected waterfront. East River Boat Tour, Brooklyn Bridge Park. Photo by Brian Thompsonrally connects visitors to the water. Brooklyn Bridge Park’s Ellen Ryan closed the tour by speaking about the park's future. As we left the park, Ryan pointed out the old Empire State Park, now part of Brooklyn Bridge Park and home to the Jean Nouvel-designed building that now houses the fully-restored Jane’s Carousel. The final stop, Queens West Stage 2 and Gantry Plaza State Park, Hunters Point, Queens, was a strong contrast to the first two parks in both design and surroundings. Petra Mager, Abel Bainnson Butz, led the tour, focusing on materials, both living and non, as a means of recalling the site’s predevelopment period. Mager explained the significance of the grasses in highlighting the formerly marshy shoreline and creating a soft edge against the weather-resistant hardscaping. NOTE: As postscript to the Chicago and New York Second Wave of Modernism conferences, co-curators Birnbaum and Amidon are preparing an edited volume of all the presentations. All photos by Ann Billingsley, unless otherwise noted.